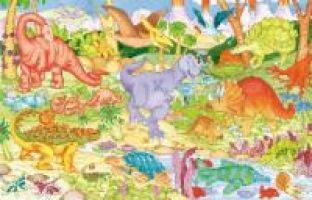 This floor puzzle has tons of cool dinosaurs to pick out - and since the pieces are cutouts of the characters, you can play fun naming games with them as you put it together! Allosaurus, stegosaurus, triceratops . . . How many can you name? See how many different dinosaurs you can find! This giant puzzle is sized for floor fun at 24" by 36"